Power cats are not that common, although they are the next-time boat in the minds – or dreams – of a great many fishermen. The reasoning is sound: within a given set of dimensions they offer more deck space and stability than a monohull, and good examples have superior sea keeping qualities. The stopper on being the actual next boat is usually the price, which is notably higher if you compare length with length. Which is a little unfair given the cat’s greater capacity, and is a reflection of extra labour and material costs plus, usually, an extra motor. 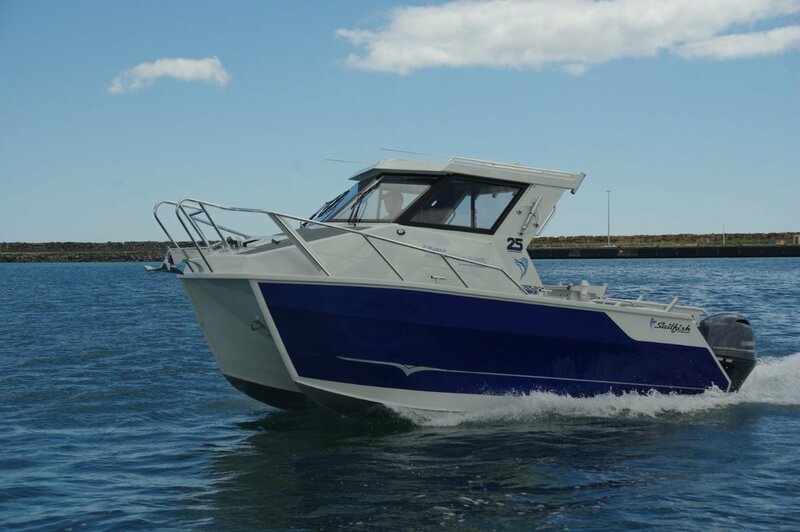 The review Sailfish Shelfrunner 6.65 at $181,000 is certainly not bargain basement, but it oozes buy-me from first boarding. An early hit in the eye after boarding through the transom walkout between the twin 115hp Yamahas were three cleats spaced down each side; cast aluminium, welded to the side decks. An unheard of number, but just what you want for easy handling alongside. Everywhere else I looked spelled thought and class. The driving position is protected by a hardtop fitted with twin skylights, toughened glass and sliding side windows. The space is lined, with panels of lining material recessed into the double skinned aluminium. This is limousine territory. The two swivelling, sliding bolster seats are mounted on boxes. 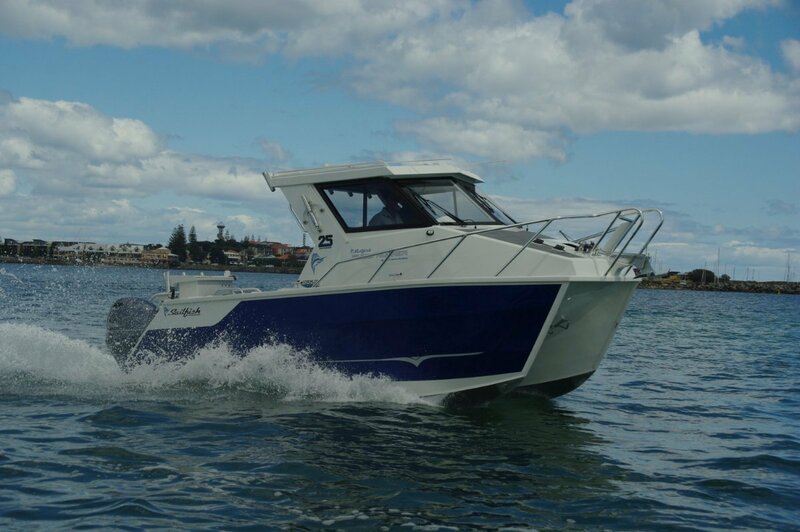 The skipper’s has a cushion with a kill tank below; the navigator’s has a slide out fridge. Alongside the kill tank are all the switches for functions that happen in the cockpit, saving footwork when fishing. 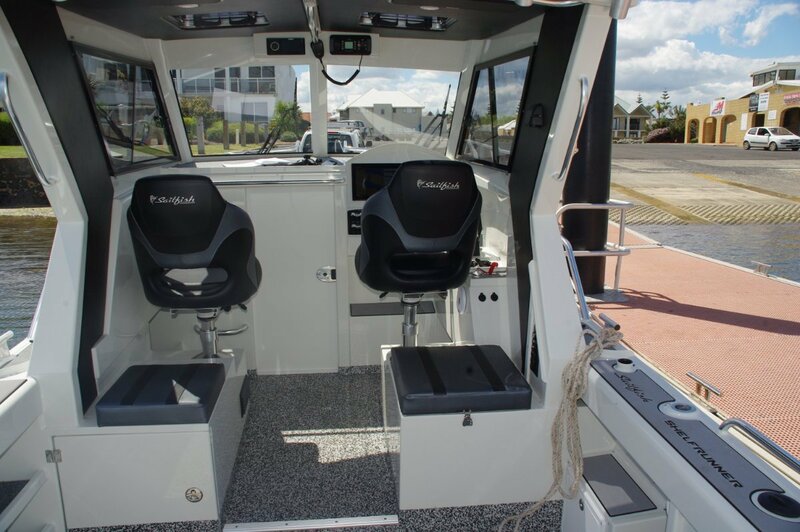 Ahead of the seats are the usual driving controls plus controls for Fusion stereo, abundant LED lights, and auxiliaries such as the stainless steel drum windlass. Further ahead, beyond a lock up sliding door, is the cabin. Fairly shallow but full beam, it could take an overnighting mattress or a mountain of gear. The deck, self draining, naturally, is protected by a particularly tough synthetic skin that is claimed to be five degrees cooler on the feet than carpet; easily cleaned by a combination of a deck wash system and self draining. Sailfish have been in business for 25 years; to celebrate they have an optional 25 year package of 25 extras, normally priced at $30,000, for $5,000. Our Shelfrunner had the package. I am not too sure about the original $30,000 value, but for $5,000 it looked all right. Bigger items include a fridge, electric reel outlets, extra windscreen wiper, pull out cockpit sunshade, outrigger bases and poles – with matching storage tubes on the trailer, which also has stone guards. A very nice touch is the factory’s practice of painting the edges of cut-outs, including those they make for equipment the dealer will be fitting. Boats generally have more places to stow things nowadays than the old timers, but few with as many as the Shelfrunner; shelves and lockers abound. Not apertures with dinky lids and dodgy hinges but genuine storage spots providing plenty of volume. One small item is particularly useful: a reef pick tube. Plenty of these around, mostly sections of plastic pipe cable tied to a stanchion. This one is aluminium and welded in the same spot; as durable as the rest of the boat. I am reliably informed that it is a near impossibility to have too many rod holders. Sailfish clearly believe this, and a quorum of Bunbury fishermen gave the thumbs up to the Shelfrunner’s share. This, though, is just a small part of the collection of anglers’ goodies. Number one is probably the stability, which is a standard fitting for cats. Other items include a Furuno touch screen combo, live bait tank, flip out tackle lockers, bait board, padded transom, burley bucket and gaff rack. Handling was a delight. The Yamahas were contra rotating and fitted with hydraulic steering, so fingertips were all that were needed. Layout of controls and positioning of the seating added ergonomics. The day was flat giving no opportunity to test behavior in a sea. The name Shelfrunner, though, implies that the edge of the continental shelf is a natural stalking ground for this cat. If there is any six and a half metre vessel I would feel happier on out there I have not yet met it.